We hit the road a bit earlier and were in the car park at the Pont du Gard before 11.30 after the drive from Arles. The aquaduct is a UNESCO world heritage site and one of the most important attractions in France. 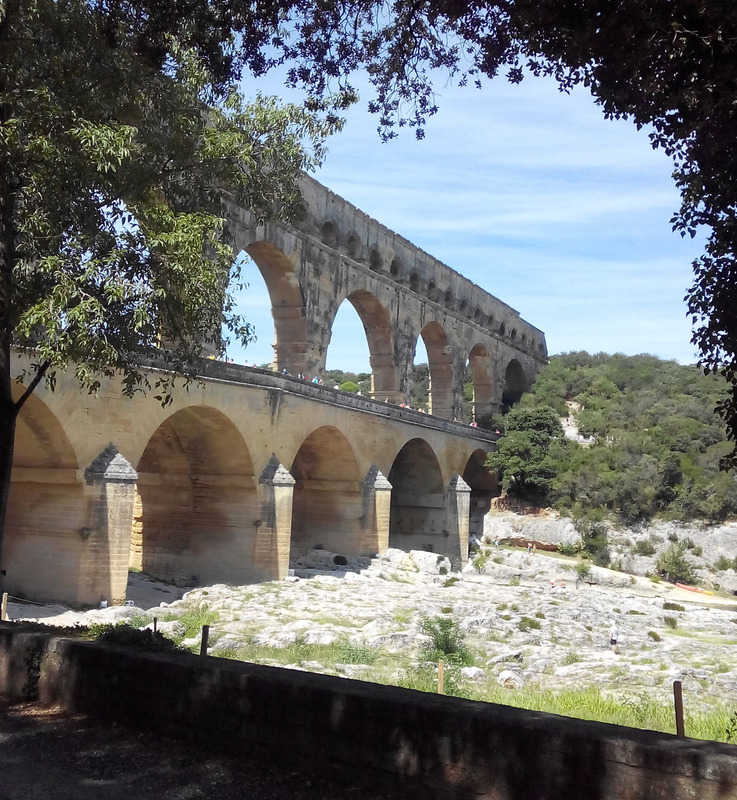 It was built by the Romans in the first century AD to supply the town of Nimes with water. I have been there before with Paulette and have painted the bridge but I’d forgotten just how massive it is. There were a vast number of people there but the site is so big we never felt really crowded. There were lots of people in canoes paddling under the bridge and many swimming and jumping off rocks into the river. Mark climbed to the top on one side while I enjoyed the view and the shade. It got to about 33 degrees today perhaps our hottest yet. 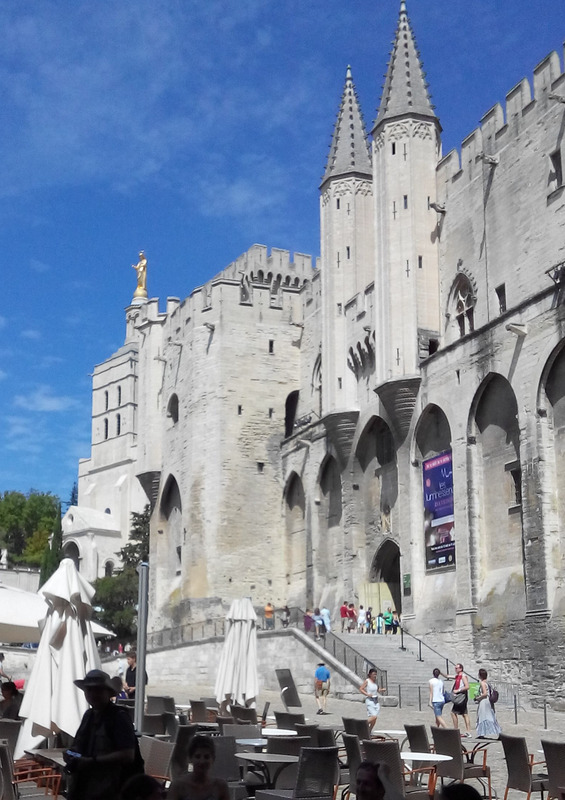 Our journey took us on to Avingnon where we checked into our hotel before visiting the historic town with its Palais des Papes where rival Popes resided in the 15 th century. The palace is massive and the town sits on the Rhone which seems to surround it, we climbed a hill above the big church near the main square which provided panoramic views. A photo of the Pont d’Avingnon was essential. The town was very busy so we found a bar in a quieter square and had a beer while listening to a couple of buskers. Next we retrieved the car from a car park 4 stories underground. We had entered the parking by the river and came out, on foot, in the center of the city. Farewell was said to the car which had served us well, then we walked back to the hotel. Hi again, what incredible sights you are visiting. We googled the area to learn more about the aquaduct etc. You will be travelling back to Paris by train shortly, and meeting Royce , and Jenny and husband. A good ending for your trip.